TPU COATED NYLON LIFT BAGS FOR RECOVERING OBJECTS FROM THE BOTTOM. With a 3-Dimensional top, gas will stay atop the bag where it is needed the most for stability. The panels are made from 210D TPU coated fabric and are radio-frequency welded for greater strength. Gas from an air source can easily enter the lift bag while underwater and its tapered entrance prevents accidental buoyancy loss at the surface. 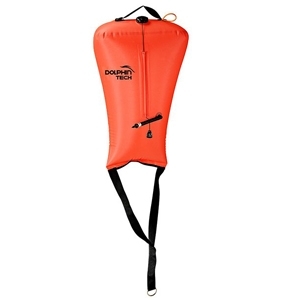 Automatic dump valve located on top of the bag provides ascent speed control and self-vents excess pressure in the event of a rapid, uncontrolled ascent. Comes with a 304 grade stainless steel D-Ring. Two bungee loops on top of the lift bag can be used to roll up the lift bag for stiorage purposes.